Can bones damage a dog's teeth? It's possible, so see the Dog Expert's advice on safe dog bones and chew toys to keep your pet from ruining his teeth. My 14-month-old Kelpie/Staffie cross seems to have already ground down her canine teeth. We have given her marrow bones, and she grinds out the marrow over a period of a couple of hours, which I imagine is the problem. I am surprised that this has happened. If the bones were too hard for her teeth, I would have thought that instinctively she would have avoided them. Any suggestions, apart from giving her softer bones from now on? I'm sorry to hear about your situation. Actually, a dog's teeth are not as sensitive, so if your dog really loves a tasty marrow bone, she simply won't care about anything but getting to that juicy inner portion of the bone. You're on track about giving her softer bones from now on. I'd recommend either Booda Bones or Nylabones. These are much easier on the teeth, and, although probably not as tasty as marrow bones, dogs do seem to like them quite well. 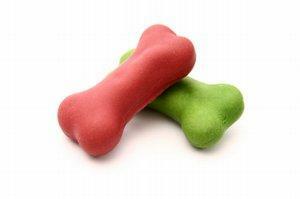 There are also floss-style chew toys that dogs enjoy, and they are also easier on their teeth. As for the state of your dog's teeth now, there's probably not much you can do to reverse the situation. However, I do think it's worth letting your vet take a look. You may get a referral to a veterinary dentist.